Take a look at why e-commerce is so important today. Learn about Electronic Data Interchange (EDI) which is involved in Business to Business (B2B) relationships and e-tailing in the Business to Consumer (B2C) area. Find out how to accept payment and how to deal with international currencies. Learn about the fulfilment process and why timely delivery is so important to the success of your business. Look at why security and privacy are such important issues for your customers and how to address them. Examine hosting alternatives, cybermalls and other issues relating to e-tailing. Take a tour of inexpensive software which you can use to establish your own e-commerce Web site. Most of these are easy-to-use solutions that don't require any programming knowledge and can get you up and running in no time. Take a look at the challenges of integrating your back office and accounting systems with your e-commerce software. A full chapter is devoted to hints on how to fine-tune your Web site and make it e-commerce friendly. There is also a brief description of affiliate programs. You will find out how to plan for e-commerce and what it is going to cost. Take a look at some of the taxation issues relating to e-commerce and then take a trip into the future and find out why e-commerce will be so important for the survival of your business in the years to come. This book is a great place to start if you want to learn about inexpensive e-commerce solutions for your small or home-based business. Find out how to do it inexpensively for about $100 per month. You don't have to spend a fortune to start selling online! What do We Mean by E-commerce? Chapter 1 How Much Business Is Being Done Over the Web? Chapter 6 - To Host or Not to Host? Get to Know the Competition! Chapter 14 - What's it Going to Cost? 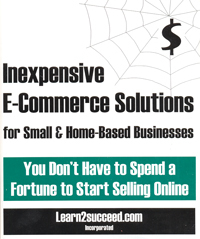 Inexpensive E-Commerce Solutions for Small & Home-Based Businesses: You Don't Have to Spend a Fortune to Start Selling Online by: Learn2succeed.com Incorporated; 130 pages, ISBN 978-1-55270-118-8 softcover; published in 2002; $24.95.